One Acton resident was left without a porch roof last week after thieves targeted a house in Acton Central. He warns other residents that their lead roofs could be at risk. 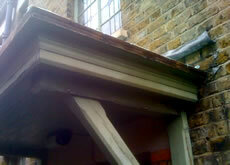 Thieves had stolen the lead roof above the front door. “I have reported it. I don't think the police have the time to investigate it though, perhaps understandably. I suppose this is why such petty crime is so rife.